Are you looking for something different to do with zucchini? 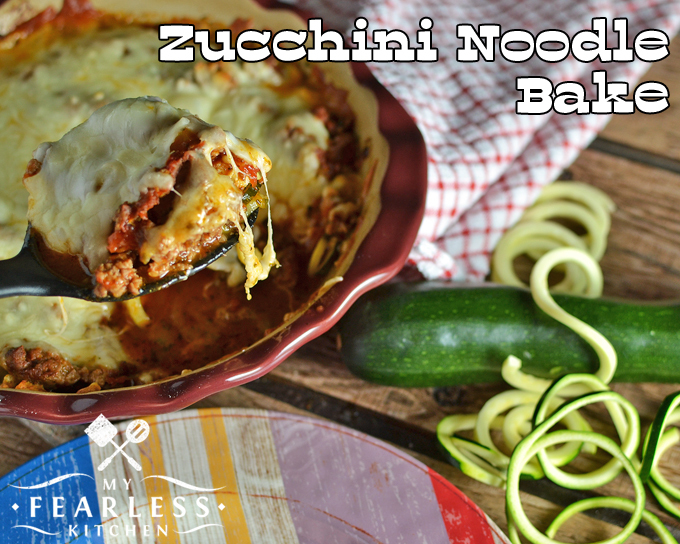 This Zucchini Noodle Bake is easy to make, fun, and the whole family will love it! Our zucchini plants have been a big bust this year. But somehow we have still ended up with lots of zucchini from friends and family. It just so happens that I also have this neat spiralizer attachment for my KitchenAid mixer, so I’ve been giving it a workout! The spiralizer attachment is easy to use, and it actually works better if you make it go a little bit faster. I just love seeing what fun things I can do with it! I spiralized 2 medium zucchini and put them in the bottom of a 9-inch deep-dish pie pan. You can also use a 9″x9″ baking pan. (Mine had blackberry cobbler in it.) Make up the meat sauce on the stove. I used ground beef, but you can use whatever ground meat you like. I also tossed in a bunch of fresh herbs from my herb garden (dried herbs from your pantry work just as well), and lots of garlic, of course. Top it with lots of cheese and pop it in the oven! And since there is no actual pasta in this dish, you don’t have to feel guilty about eating some tasty homemade bread along with it! Brown ground beef over medium heat in a large saucepan. Drain and return to pan. Add olive oil, pasta sauce, tomatoes, herbs, and garlic to meat in the pan. Cook over medium heat, stirring frequently, until sauce thickens to desired consistency (about 10 minutes). 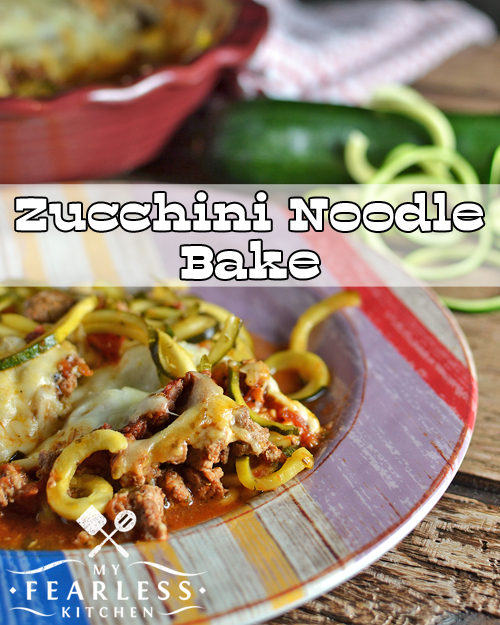 Using a spiralizer attachment on an electric mixer, cut zucchini into spiral noodles. Place spiralized zucchini noodles in a 9-inch deep dish pie pan (or a 9"x9" baking pan). Add salt and pepper, if desired. 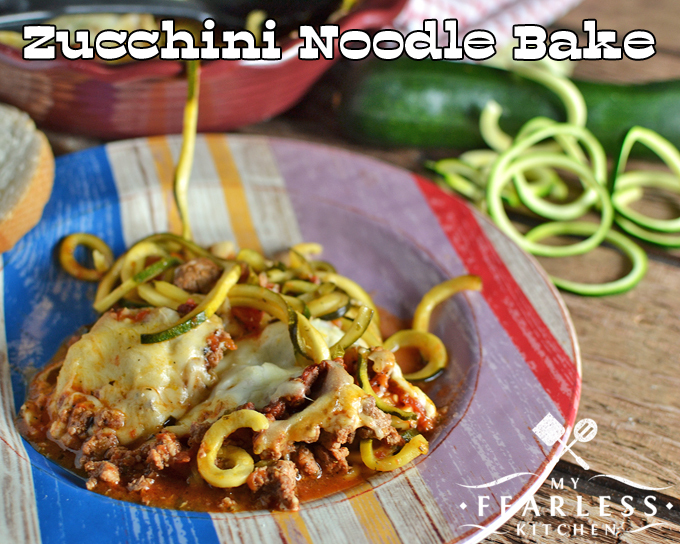 Top zucchini noodles with meat sauce. Top with cheese. Bake, uncovered, at 350 degrees for 25-30 minutes until hot and bubbly. « What Foods Are GMOs?